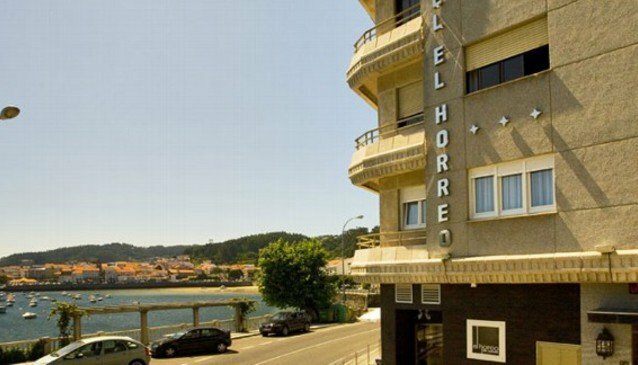 The 3 star 'Hotel El Horreo' has more than 20 years experience and is located at the foot of the Corcubión Estuary, by which its rooms, as well as facilities have unsurpassable views of the sea. Facilities have been partially renovated in 2009 and the majority of rooms have sea views, balconies or terraces. It is situated 12km away from Finisterre Lighthouse, in the middle of the route of the Way of Saint James and 70km away from Santiago de Compostela and 90km from A Coruña. The hotel is situated in the urban area of Corcubión (A Coruña) and is catalogued as cultural and historic heritage, for the timeless enchantment of its streets. From Corcubión there are innumerable excursions to travel through and enjoy the Costa da Morte, and also to rest and contemplate nature in its wild beaches and hiking routes. The hotel counts with 'Restaurante El Horreo', a gastronomic restaurant of modern cuisine, elaborated with native Galician produce, as well as the cafeteria, where you may sample our delicious breakfasts, teas and our carefully prepared cocktails. Likewise, there are also function rooms and a restaurant for events, lounge with fireplace, wifi zone, bike hire and parking.